One of the biggest selling points of the new Nokia smartphones is the quick update process, as promised and delivered by HMD Global. The company has kept its word nearly every month and handles software updates more quickly than rivals Samsung, LG and Sony, who have many more resources at their disposal. 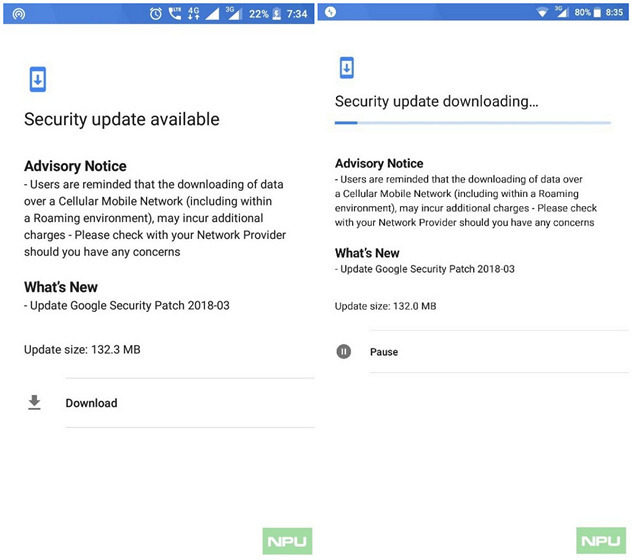 And the streak continues as Nokia 5 and Nokia 6 smartphones have started receiving the March Android Security update just days after Google started rolling it out for the Pixel devices. According to NokiaPowerUser, the update has already started rolling out in many regions around the world, including India, Bangladesh, Malaysia, UK, Hungary, Germany, Philippines, Mexico, Sri Lanka, Greece and Tunisia. If you own either of the two devices and haven’t received the notification already, you can check for it manually by going over to Settings > System updates. As can be seen in the image below, the software weighs in at 132.3 MB for the Nokia 5 and 132 MB for the Nokia 6. While HMD hasn’t released a detailed changelog for the incoming software, Google says its latest Android Security Bulletin fixes “a critical security vulnerability in Media framework that could enable a remote attacker using a specially crafted file to execute arbitrary code within the context of a privileged process”. Timely software updates, or the lack thereof, has been the bugbear of Android devices ever since inception. However, even as some OEMs try to comply with Google’s monthly update patches, an overwhelming majority of Android vendors just aren’t bothered. As far as HMD is concerned, it is really heartening to see the company pushing out security updates to the two devices this quickly, and one can only hope that the company will continue to follow the practice with its upcoming devices.